For families who have elderly or disabled family members, safety would surely be their top priority and walk-in tubs are considered to be a safer choice for them as compared to the traditional tubs on the market. After all, they are designed for people with mobility problems. This is the reason why they have a V or U shaped door that one can simply walk into instead of them needing to step over just so they could get into the tub. Ariel Walk-In Tubs is one of the known brands that have been garnering positive reviews due to the high-quality products that they offer. This brand ensures that their bathtubs are complete with the necessary safety features, allowing its users to have a secure yet comfortable bath. This includes non-slip floors and handles. To meet the specific needs of their customers, this brand also offers their tubs in both left and right configurations. Apart from tubs, they also offer other products like vanities and toilets. More than anything else, this brand offers products at a reasonable price, and they have been doing that for more than 25 years already. What Ariel Walk-in Tubs Most Customers Love? 1 What Ariel Walk-in Tubs Most Customers Love? 1.1 1. 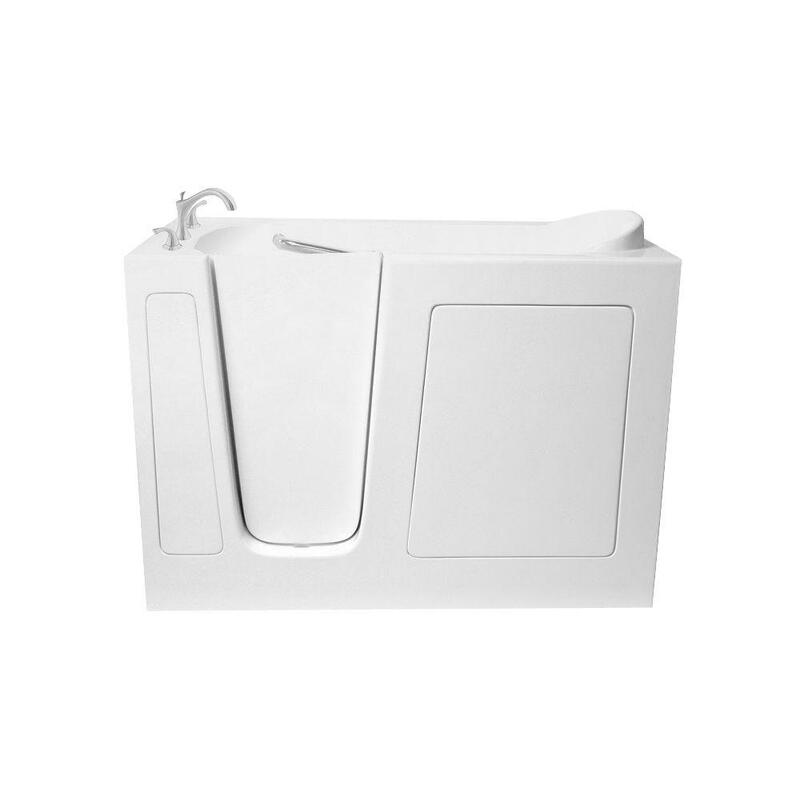 Ariel White Walk-in Bathtub (Right Hand) 4.25 Ft.
1.2 2. White Walk-in Bathtub (Right Hand) 5 Ft.
1.3 3. White Air and Whirlpool Walk-In Bathtub, 4 Ft.
1.4 4. 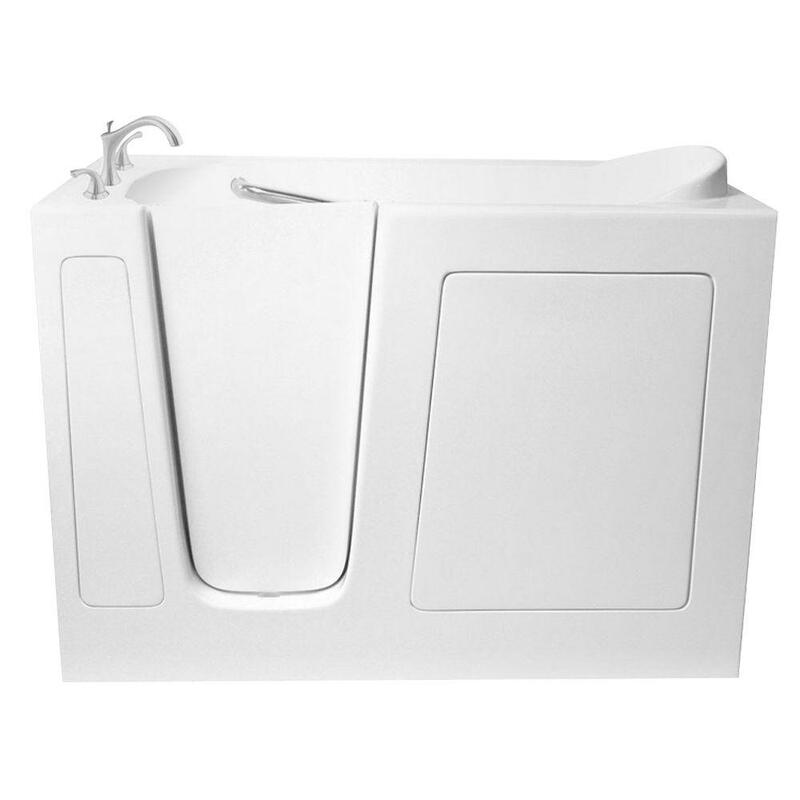 White Air and Whirlpool Walk-In Bathtub 4.5 Ft.
1.5 5. White Air and Whirlpool Walk-In Bathtub, 5 Ft.
1. 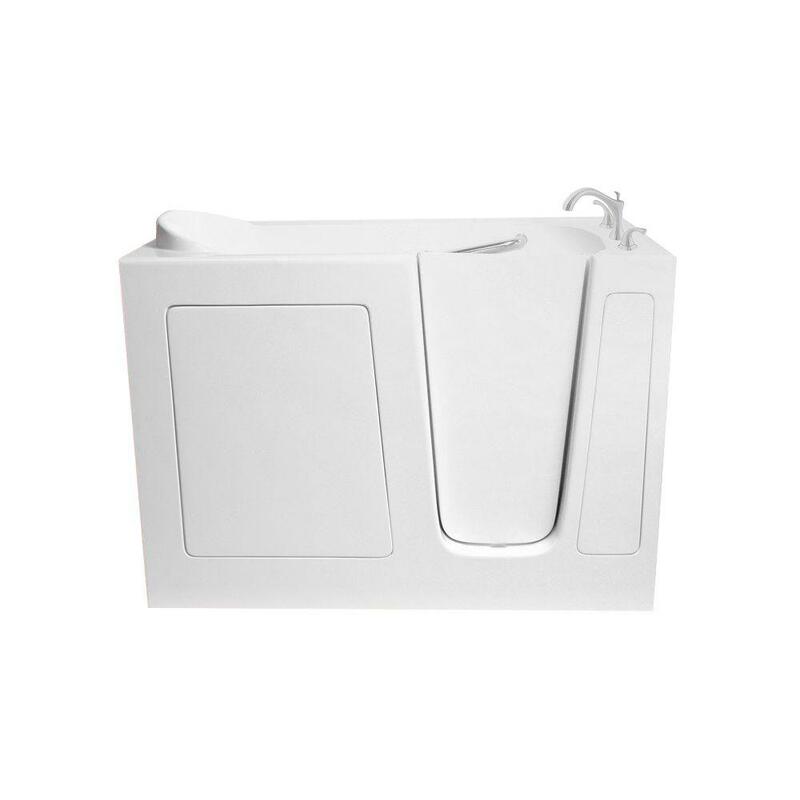 Ariel White Walk-in Bathtub (Right Hand) 4.25 Ft. This tub is an ADA compliant, which means that it offers a safe accessibility. One is also assured that the water would not leak through the door while it is in use since it has a water-tight door. Some customers have named it the best walk in tub due to the fact that this tub is made from acrylic and is reinforced with fiberglass, making it a durable tub. As it is 23 inches wide with a 17 inches seat height, customers were able to submerge themselves in the tub comfortably. It has a slip-resistant floor that offers safety. It has a grab bar and a built-in seat. It comes with a handheld shower head. The tub does not have jets pump. 2. White Walk-in Bathtub (Right Hand) 5 Ft.
Having a textured bottom, this makes it a safer option for those who wanted to have a relaxing bathing experience. Not only does it have a water-tight door, but it also has a triple high gloss gel coat. Also, as it is made from durable materials, one can enjoy using it for years. What customers love about this tub is that it is quick to fill up and to drain. It also did not take them a lot of time and effort to install it. All in all, it makes bathing much easier for handicapped people. It comes with roman faucets. It has a water capacity of 78 gallons. It can only accommodate one person. 3. 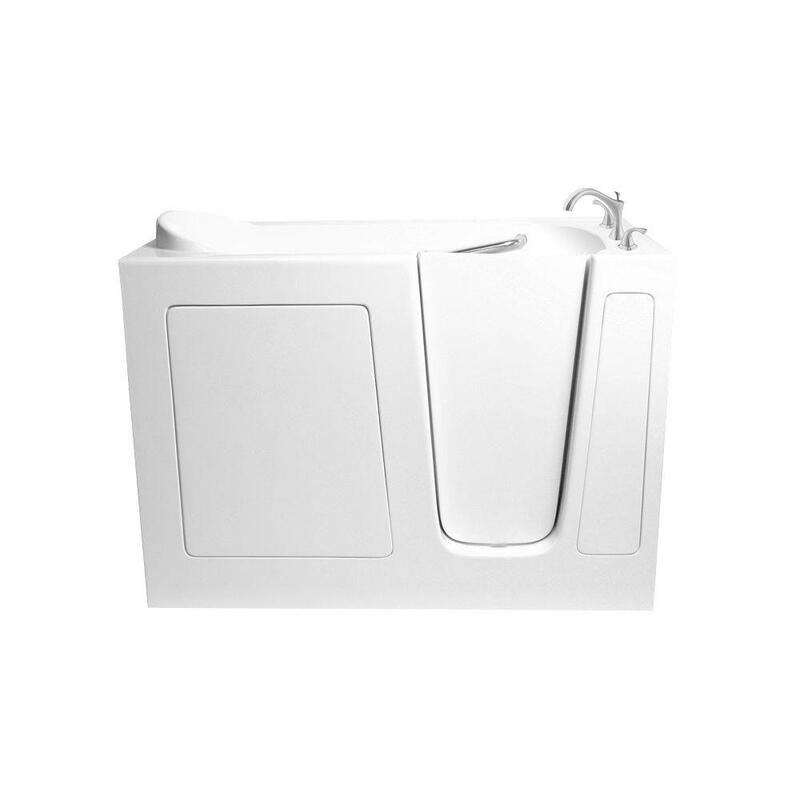 White Air and Whirlpool Walk-In Bathtub, 4 Ft. While the first two products review does not have jets and pump, this one has dual air jets and whirlpool jets. Hence, one cannot only enjoy a good soak in warm water but also a good massage as well. This tub was able to provide its users with a relaxing bathing experience, thanks to its 24 jets. It also has a built-in flange while the drain is conveniently located in the right. It has 6 hydro jets and 18 air jets. The flow and the direction of the jets can be adjusted. It has a 1.75 HP hydro pump. 2 20 amp. ground fault circuits are needed for this tub. 4. White Air and Whirlpool Walk-In Bathtub 4.5 Ft.
As this tub has air and whirlpool jets, one can enjoy a relaxing acupuncture body massage and foot spa experience. It does a good job in providing hydrotherapy. It also comes in both right and left configurations. Customers have emphasized that not only does it look great, but it works great as well. Also, it only takes about 3.5 minutes for this tub to be drained. It includes a drain and a heater. As it has jets, it is ideal for people who have arthritis. Its water capacity is only 45 gallons. 5. White Air and Whirlpool Walk-In Bathtub, 5 Ft.
For people who are looking for a tub that can provide them a full body massage, then this is the one that they are looking for as it has multiple air bubble jets and large hydro jets located inside. Customers gave this tub a good feedback for the reason that the pneumatic buttons for its jets are electro-safe. Customers have also found it to be very comfortable due to its large size. It has a soaking depth of 29.75 inches. It comes with a 2 inches drain. It only has one jet setting. To end our Ariel walk in tubs reviews, we would like to declare the 5 Ft. White Air and Whirlpool Walk-In Bathtub as the winner. With the fact that it is bigger than the others in size, it only means that it can provide more comfort and space to move to the one using it. It also has a non-slip floor, fiberglass design, and a triple high-gloss coating that makes it very durable. The doors are also tightly sealed, which prevents water from leaking and accidents from happening in the bathroom. For a completely relaxing hot tub experience at home, using the Ariel tub together with a steam shower is a good idea. To sum it up, it cannot only be used for bathing but for relaxation purposes as well.